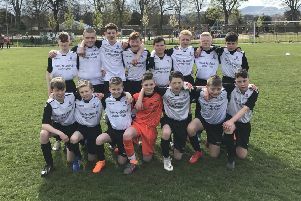 Edinburgh City Whites Under-13s advanced to the final of the Persevere Cup after a convincing win over Edinburgh South Jaguars. The final score was slightly harsh on Jaguars, as the game was close throughout the first half, with both teams creating chances in front of goal. The Jaguars were first to take the lead. Idriss Benfayed’s attempted cross into the penalty box was blocked by a City hand and Benfayed stepped up himself and drilled the ball into the bottom-left corner of the net. The equaliser came not long after when Michael Fairgrieve beat a number of Jaguar’s defenders, moving the ball quickly from foot to foot, before playing in Liam Collins to score. James Buchanan was a creative force in midfield for City. Most positive play was fed through him and he assisted Fairgrieve for their second goal, poking the ball under the keeper from close range. However, Jaguars managed to pull level before half-time. Jonny Mure burst down the left flank and picked out James Hoggan, who ran onto the ball and with a deft touch found the back of the net. After the break City looked a very dangerous team. They were hungry for goals and didn’t allow their opponents any time on the ball. They quickly stamped their authority on the match, scoring twice in two minutes. Jamie Hook was left unmarked at a corner and showed great technique to volley the ball into the net before Fairgrieve scored his team’s fourth of the game. Conceding early after the restart clearly had an impact on Jaguars’ game and they struggled to contain the City attack. Collins, Paul Cassie, Ciaran Bridges then Cassie again added to the scoresheet, taking the final score to 8-2. The highlight of the second half was Bridges’ goal, a free-kick from roughly 30 yards out which he rocketed into the net. • Currie Star Under-15s caused an upset in the Federation of Hearts Supporters Cup as they overcame Leith Athletic Colts 1-0. Alex Backler and Mack Valentine were a constant threat on both flanks for Currie. They got their reward when Backler fed the ball inside to Ross McKinlay. A Leith defender was able to get in the way, but he was closed down and the ricochet fell to Backler, who stroked the ball across the diving keeper into the far corner. As the match progressed Leith became more of an attacking threat, but the Currie defence stood firm and kept a clean sheet. • Lothian Colts Under-13s are into the semi-finals in the Colin Campbell Sports Cup after defeating Tranent Colts 4-3. Tranent were first to score, but Lothian responded as Charlie Robinson crossed the ball into the box and Jamie MacLeod tapped in. Tranent scored a further two goals in quick succession, but Calvin Robbins converted a penalty for Lothian, taking the score at half time to 3-2 in Tranent’s favour. Lothian’s Lewis Scott curled a brilliant free-kick from 25-yards out into the top right corner to make it 3-3. Krzysiek Goldie was the dangerman for Lothian, but after coming off injured the responsibility fell to Robinson, who scored the winner late on. Lothian keeper Charlie Barber kept the score at 4-3 in the remaining minutes, ensuring their progression in the cup.